ISKCON Temple, Mumbai or Radha Ras Bihari Mandir like all ISKCON temples is dedicated to the worship of Lord Krishna and one of the beautiful temples in Mumbai. 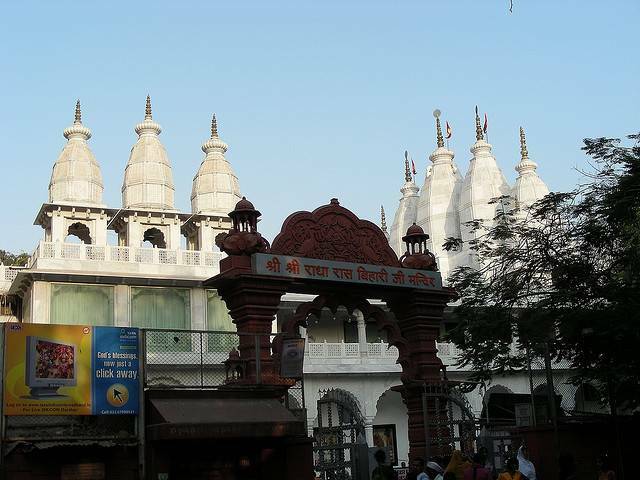 Sprawling over 4 acres, the Mandir is built out of Marble Stone. The 100 feet Marble dooms welcome you pleasantly. The Mandir which is located nearby Juhu beach is completely dedicated to Lord Krishna and Goddess Radha. In this Radha Ras Bihari Temple, one can also see statues for eight companion of Goddess Radha. Within the Mandir Complex, beside Main Shrine, there are eight-storeyed Guest House, An auditorium, restaurant and a bakery to serve the tourists and pilgrims. In the main prayer hall religious chants are played and one can see the devotees are completely relaxed and indulge in spiritualism in this temple. If you’ve not been to ISKCON Mumbai temple, this is the place to visit and get fully topped up on your positive energy. With a friendly atmosphere, and many cues to help the aspiring spiritualist, even for the non-believer this temple will give you a something to enjoy, and their restaurant is one of the most recommended for authentically prepared local cuisine.